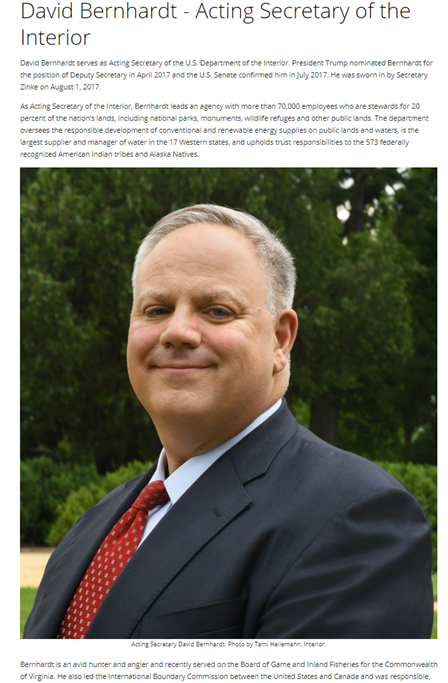 The Department of Interior’s (DOI) biography page for David Bernhardt, the nominee for Secretary of the Interior, omits description of Bernhardt’s long history of work for fossil fuel and mining companies who have a vested interest in increased access to the public land that the DOI stewards and illustrates how agencies are becoming increasingly unreliable sources for objective and thorough public information. It’s important to highlight these omissions today as the U.S. Senate Committee on Energy and Natural Resources is considering confirming David Bernhardt as the Secretary of the Department of the Interior (DOI). 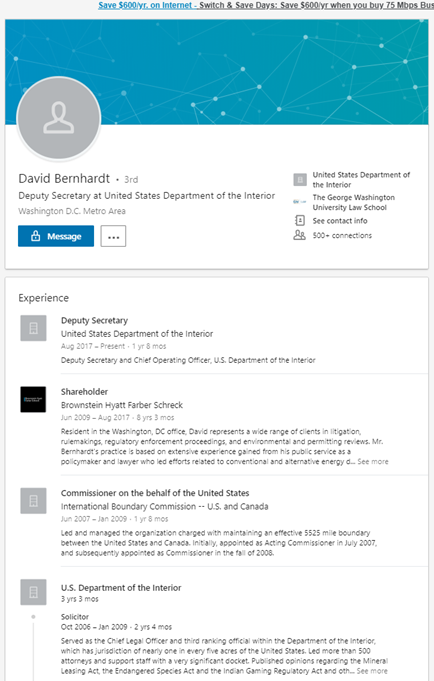 Bernhardt has served as Acting Secretary since the previous Secretary, Ryan Zinke, resigned at the end of 2018 in the midst of scandal and federal investigations. His nomination for secretary continues a worrying trend toward increasing fossil fuel industry influence over public agencies. None of Berhardt’s work for fossil fuel and other industrial interests are specifically mentioned in his official bio on the DOI website. 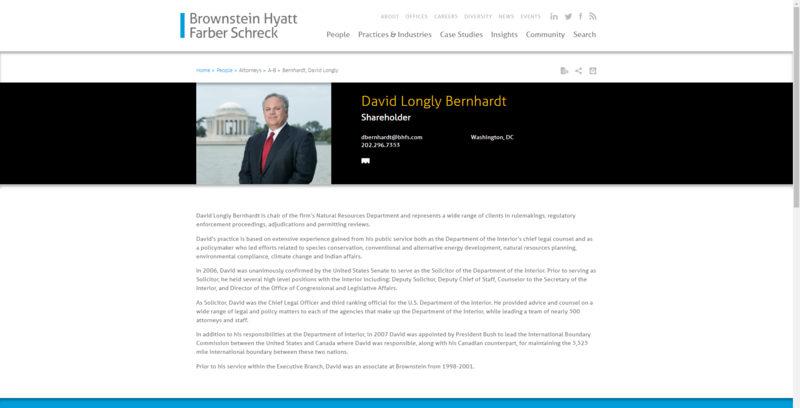 There the public can learn that Mr. Bernhardt has served the DOI with distinction since his swearing in (August 1, 2017), and gained critical legal and regulatory experience while serving in several other positions within the DOI, including Solicitor, under the Bush administration from 2001 – 2009. However, no mention is made of the years between 2009 and 2017, though his contributions to a federal commission and on a board to a Virginia state agency are highlighted without time associations. Important things happened in Bernhardt’s career from 2009 to 2017 that are pertinent for the public. Thankfully, other online bios offer a fuller picture of his background. LinkedIn is a natural place to start in this effort. His profile there shows that he served on the commission mentioned above during his time at DOI under President Bush. It also indicates that from June 2009 – August 2017 (right up until the time of his swearing in) he was a “Shareholder” at the law firm of Brownstein Hyatt Farber Schreck (BHFS). David Bernhardt’s edited BHFS bio where mention of his work on behalf of energy, mining, and agricultural interests, usually against federal agencies and regulations is removed. David Longly Bernhardt is chair of the firm’s Natural Resources Department and represents a wide range of clients in rulemakings, regulatory enforcement proceedings, adjudications and permitting reviews. In addition, David provides comprehensive strategic counsel to several corporate, government and non-profit entities. His multi-disciplinary practice provides advocacy and advice to clients on issues originating from Federal administrative agencies, the White House, Congress and the courts, with special emphasis on issues, transactions and cases related to the environment, energy, natural resources and wildlife. The Nation’s largest federal water contractor in the Ninth Circuit Court of Appeals regarding Endangered Species Act litigation involving the Bay-Delta in California, a case widely considered one of the most complex Endangered Species litigation cases in the country. A national trade association in Federal District Court interested in defending the U.S. government’s decision to proceed with an offshore lease sale under the Outer-Continental Shelf Lands Act. An entity challenging the U.S. Fish and Wildlife Service for violating the Endangered Species Act in Federal District Court. Alternative energy developers involved in projects seeking to comply with the National Environmental Policy Act (NEPA), the Federal Land Policy and Management, the Endangered Species Act, the Migratory Bird Treaty Act and the Bald and Golden Eagle Protection Act. An electric transmission facilities developer that crosses lands in federal jurisdiction. 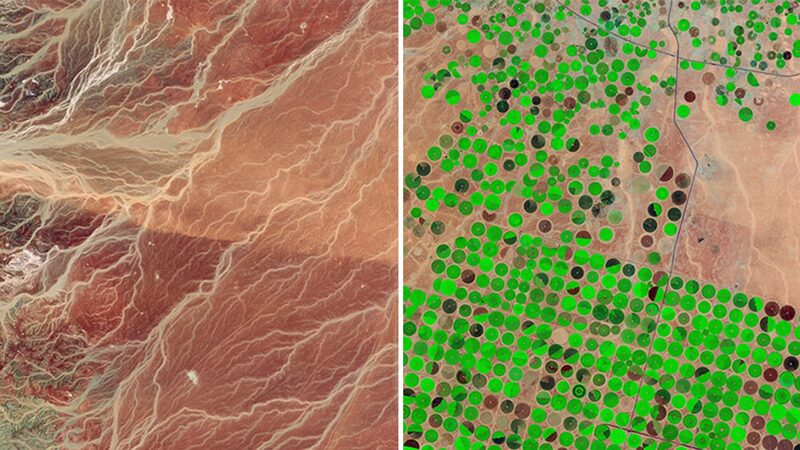 Mining companies who intend to develop potash or copper resources on private, state and Federal lands. A mining company undergoing an audit regarding royalty payments. An entity under investigation by a Federal Agency. An entity involved in energy development on Indian lands. Entities accused of violating the Department of the Interior’s regulations. David’s practice is based on extensive experience gained from his public service both as the Department of the Interior’s chief legal counsel and as a policymaker who led efforts related to species conservation, conventional and alternative energy development, natural resources planning, environmental compliance, climate change and Indian affairs. So, what does all of this mean? While Bernhardt’s work history strongly implies a likelihood of bias in favor of industry, it is not itself a proof of bias – particularly without more detail on the specifics of the experience listed in his biography. However, there have been indications of his involvement in significant changes made in DOI policies and regulatory stances during the Trump administration particularly around endangered species, protection of migratory birds and efforts to address greenhouse gas emissions. Reverse previous departmental efforts to slow greenhouse gas emissions in order to arrest climate change and removing critical public information about those efforts. The New York Times highlights Bernhardt’s involvement in blocking a Fish and Wildlife Service report on the potential negative effects of two pesticides on endangered species, an issue which simultaneously highlights the DOI’s efforts, under Bernhardt’s active direction, to offer extractive industries greater flexibility at the expense of conservation and preservation, and their efforts to reshape how regulatory science is done. From DOI orders it is clear where Bernhardt stands on issues related to preservation public lands: he often makes decisions that favor oil and gas extraction over preservation and environmental protection. He wrote and signed DOI Order 3360 implementing presidential orders to increase domestic energy production by, among other things, rescinding standing policies in the DOI regarding climate change and oil and gas extraction mitigation. 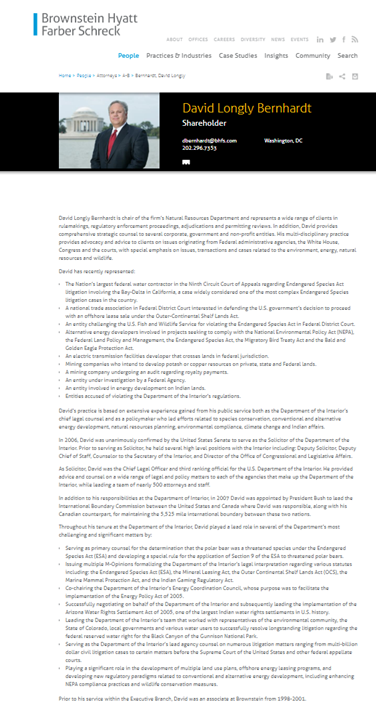 Similarly, Bernhardt is responsible for DOI Order 3355, which has as its goal and title “Streamlining National Environmental Policy Act Reviews,” an effort which short circuits critical environmental safeguards like Environmental Impact Statements and public commentary periods. and historic revenues generated by the leasing of BLM lands for oil/gas extraction within the U.S. It would be unfair to say that the DOI under Bernhardt and his predecessor have done nothing to protect lands, people, and wildlife in the U.S. Bernhardt has, for example, supported initiatives to reinforce the importance of public access to public lands, worked in a limited fashion to add to those lands, and maintained support for mine reclamation despite an enormously slashed budget.7 However, it is clear from their policy revisions, deregulatory efforts, and full-throated support of President Trump’s push to significantly increase fossil-fuel energy production in the U.S. that, on the whole, their priorities begin with private-sector energy interests before considering conservation and preservation efforts. The appointment of a new Secretary is a unique opportunity for the Trump administration and the Department of the Interior to reaffirm a commitment to managing public lands and resources in a manner which supports the interests of the American people, today and into the future, over short-sighted extractive industry interests. Unfortunately, the nomination of Bernhardt illustrates a lack of will to take that route. Moreover, from the blatant omissions of Bernhardt’s potential conflicts of interest from his official DOI bio to the removal of important public information about climate change and the killing of migratory birds during industrial operations, the public should also be concerned about the government’s democratic accountability, which begins by providing its citizens with objective and thorough information. It is highly likely Bernhardt will be confirmed for the position both by the committee on Thursday and in the full Senate afterward. The composition of the Senate Committee has not changed since his confirmation as Deputy Secretary, and the Republican Party has increased its Senate majority since his confirmation as Deputy Secretary. 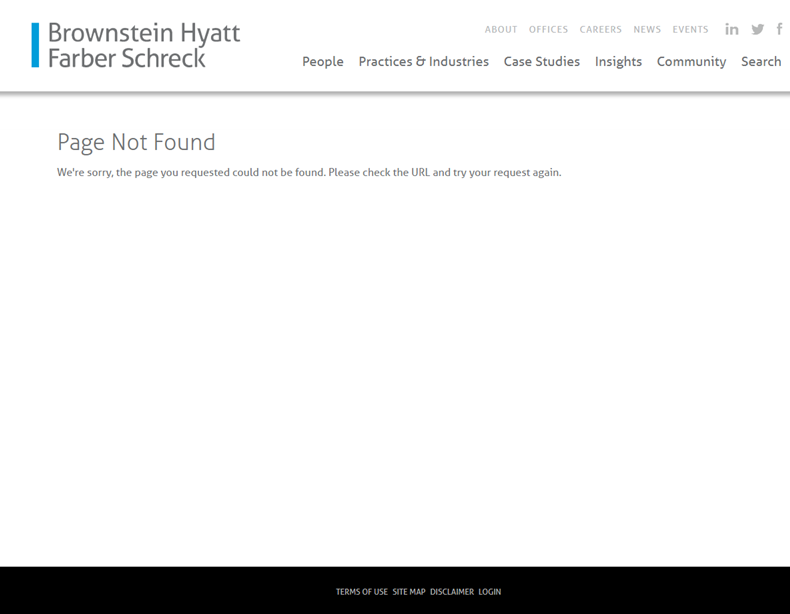 Archived web pages courtesy of the Internet Archive’s Wayback Machine; acquired by searching for “https://www.bhfs.com/people/attorneys/a-b/dbernhardt” after ascertaining the BHFS website’s url formatting structure for bio pages. As a reminder, this is the position Bernhardt held while working for DOI under President Bush. Jorjani also worked in close proximity with Bernhardt as a DOI lawyer during the Bush administration and is currently awaiting congressional confirmation to officially take on the Solicitor position. Another interesting point to draw out of this particular piece is Reveal’s assertion that Bernhardt avoids creating paper trails, which complicates the public’s ability to see under the hood on DOI policies and legal decisions. See also a report from the Washington Post on his refusal to maintain a calendar of meetings with non-governmental organizations. It should also be noted that we support the great work of the thousands of employees of the DOI and its Bureaus. There are many people there passionate about public lands, conservation, and wildlife protection who are doing great things every day.